Sarah Colville Montgomery (1834-1892) was the daughter of Andrew Colville Montgomery and his second wife, Evalina Green. The family lived in a two story house on Old Knoxville Highway east of Maryville. Her father was a farmer and operated a grist mill and wool carding factory. He saw that his children were given a good education, and helped to found the East Tennessee Masonic Female Institute in Maryville. When Sarah married James Gillespie Russell in 1853, she moved into a large brick house on the Russell Place Farm in the Louisville area west of Maryville. James Russell became a founder of Ewing and Jefferson College, later known as Holston College. The Russells had six children. Both Sarah and her husband are buried in the Holston College Cemetery, Blount County. 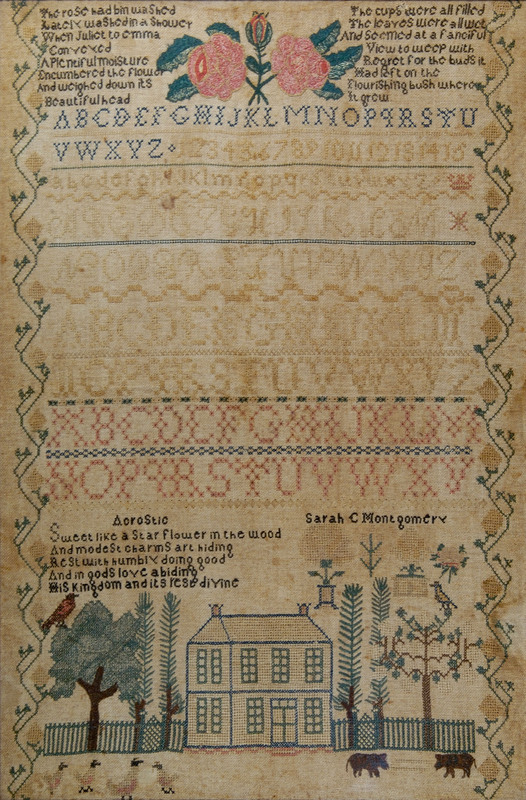 Sarah’s sampler serves as a transitional piece between the Lynchburg group, associated with the Knoxville Female Academy, Knox Co., and the large satin stitched flower samplers of Bolivar Academy, Madisonville, Monroe County. 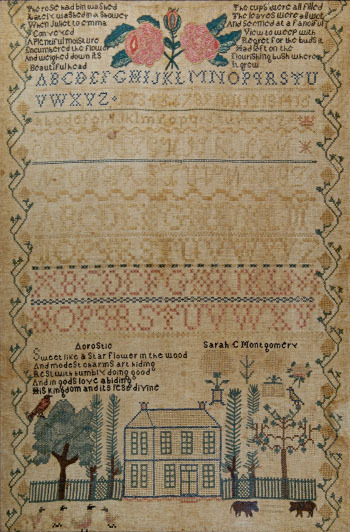 The lower third of Sarah’s sampler, with the house, fence, and floral motifs, is similar to those found on c. 1832 Jane Campbell (TSS 034), c. 1829 Catharine (Kittie) Dardis (TSS 116), 1834 Mary W. Williams (TSS 180), and c. 1834 Sampler Fragment (TSS 181). Sarah’s alphabets, especially the upper case italic one, are identical to those of the Knoxville samplers. The large satin-stitched roses, prominently centered at the top of the sampler, share the same technique used on the c. 1834 Mary Wallace Montgomery sampler (TSS 184) and the two samplers worked by Malinda Ann McCroskey in 1834 and 1836 (TSS 223 and TSS 224). The acrostic, directly above the cardinal in the tree, spells out Sarah’s name with the first letter of each line. Her father composed it for her.